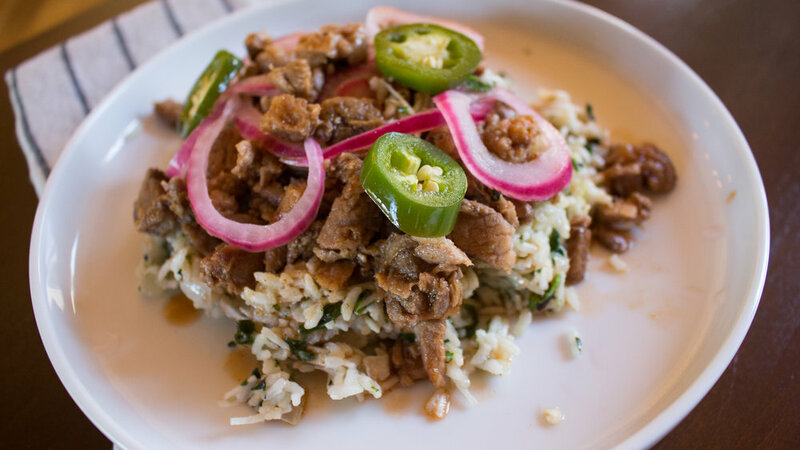 Slow Cooker Asian Pulled Pork w/ Coconut Rice — Happy Food Co. WARM contents of olive oil packets in large sauté pan over high heat. SEASON both sides of pork steaks generously with salt and pepper. SEAR pork steaks on both sides until well-browned, about 2-3 minutes per side. MIX beef broth concentrate with 4 cups warm water in liquid measuring cup. ADD beef broth, broth bag (yellow onion, garlic, jalapeños), coconut aminos, 1 tablespoon of sugar and ¼ cup rice vinegar to slow cooker or Instant Pot® . TURN slow cooker to desired temperature setting (high or low) OR Instant Pot® to high. COOK for 4-5 hours on HIGH heat or 8-10 hours (overnight) on LOW heat in slow cooker OR 45 minutes on HIGH in Instant Pot®. If using an Instant Pot®, quick release pressure when pork is finished cooking. COMBINE remaining sugar, remaining rice vinegar and ½ teaspoon of kosher salt in a small saucepot. PLACE contents of “pickle me” bag (red onions and jalapeños) in medium bowl. Separate onion rings as needed. COOK vinegar mixture on medium-high heat until sugar has dissolved, about 2 minutes. POUR vinegar mixture over onions and jalapeños in bowl. WRAP bowl tightly with plastic wrap and set aside while pork continues to cook. MELT coconut oil over medium-low heat in same saucepot used to make vinegar mixture. SAUTÉ white onion until soft but not browned, about 3 minutes. ADD jasmine rice and shredded coconut and sauté for 1 minute, mixing to combine. STIR IN coconut milk and 1cup of water. Season generously with salt & pepper. COVER with lid and simmer on medium-low heat for 15-20 minutes or till liquid is absorbed. CHOP mint into small pieces on cutting board. REMOVE rice from heat and stir in chopped mint, green onions and cilantro. SLICE lime in half on cutting board and finish rice with a squeeze of lime juice. TASTE rice and re-season as needed with salt and pepper. REMOVE the bones and fat from pork. SHRED the meat with fork in large bowl. ★ TIP: Save seasoned broth and use as a soup stock like customer, Julie Elfving! MIX shredded pork with sweet & spicy sauce. 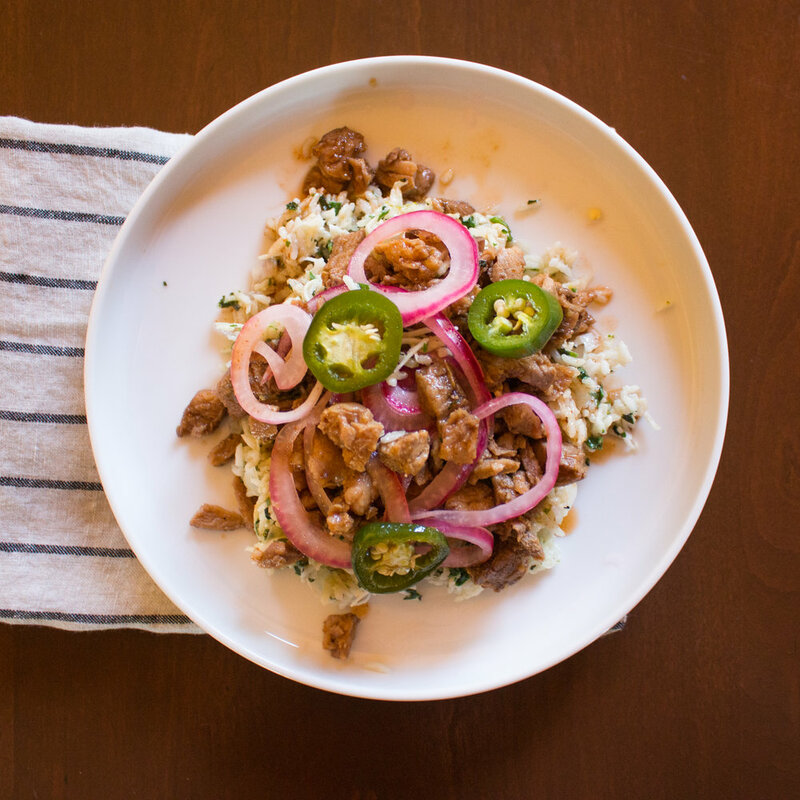 SERVE the shredded pork over the coconut rice with pickled onions and jalapeños and enjoy! You’ve earned it. This wine offers delightful aromas of honeysuckle, tangerine and Kaffir lime leaf. This fruit-forward and layered palate has notes of ripe green apple, Meyer lemon and tart pineapple that blend with hints of florals and crisp minerality.